THIS IS A STEAL! 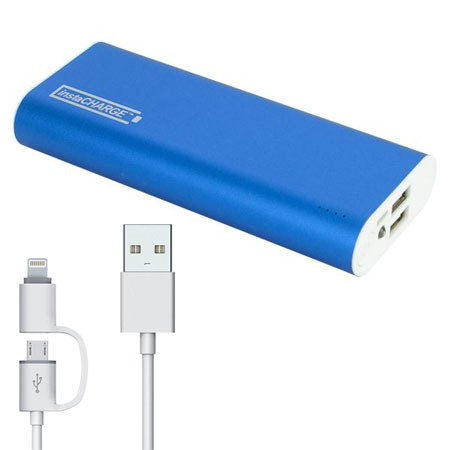 InstaCHARGE HIGH CAPACITY Dual USB Rapid Charge Portable Power Bank With Power Indicator For Phones, Tablets and more! Comes with 2-in-1 iphone / android (micro usb) cord! Oh, and because it's dual port, you can charge 2 things at once! Available in 9,000 ($9.99) and 12,000 ($12.99) mAh capacity (both are a LOT of juice for your devices!) - ORDER 10 OR MORE AND THE PRICE DROPS BY $1 EACH! SHIPS FREE! It's happened to you. You're out and about when, suddenly, your favorite gadget fizzles. Your phone is dead or your tablet is done for the day. Fortunately, instaCHARGE has your portable power needs covered. This handy device packs plenty of charging capacity into a small unit you can take anywhere. Simply plug your device in and you can get a full or near-full charge so you can keep working, playing and connecting while on the go.